The new Hard Rock Hotel in London will be integrated into the existing Cumberland Hotel at Marble Arch. We were appointed to consider the primary entrance and ground floor guest experience. Our design comprises the check-in, the Hard Rock Café, the Rock Royalty (VIP Guests) and all other associated facilities within the Hard Rock Café brand. Our design concept is derived from the deconstruction of music and fashion – the layers that go into the creation of music, fashion, architecture and art. This is embodied in the main central lounge bar with an abstract installation of the master disc dropping into the record player, whilst memorabilia is suspended from the walls amongst taut guitar strings in a “larger than life” fret board. 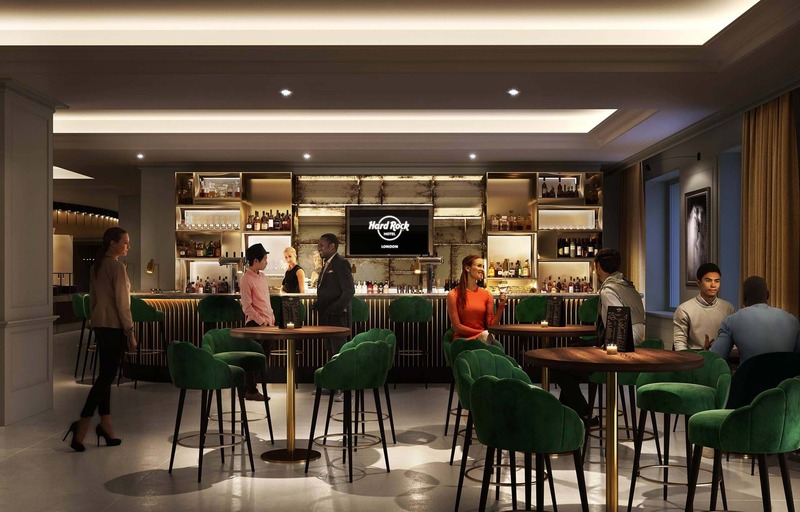 The scheme demands an awareness of the 4* London market to meet the clients high design expectations whilst incorporating the Hard Rock “mantra” which includes the global brands’ range of memorabilia, artwork, installations and lyrics.